We love yogurt in our family*. The unsweetened, thick, creamy and tangy kind. We enjoy yogurt for breakfast (with fruit) and sometimes dessert (with dates + chocolate + nuts). We top our soups with yogurt, we add it to smoothies and ice pops and we also dress our salads with it (Isac likes to dress himself with it as well). Yogurt works remarkably well both with sweet and savory flavors. And yet, the thought of making a yogurt bowl with savory toppings instead of sweet, had never struck us before. 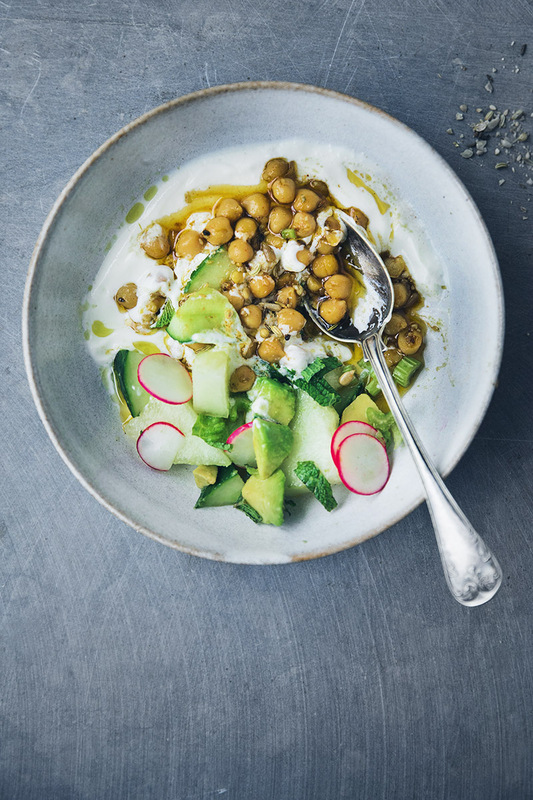 But as we were playing around with this crunchy cucumber and melon salad with spiced chickpeas, we (and with we, I humbly mean ME, MYSELF and I – as in, not David) had the simple idea to put them on a bed of yogurt instead of doing the usual yogurt dressing. In theory, it’s more or less the same thing but in reality it’s so much better. The warm, rich and spicy chickpeas on a bed of cold, thick and tangy yogurt, with the addition of a fresh salad with lots of crunch. It’s simple but yet so very good. And quick too. I’m sure there are plenty of savory yogurt bowls all over internet, but now they are also in our kitchen. *David and Isac are actually intolerant to dairy but yogurt is their weak spot. We buy oat yogurt for them but David often chooses a day of stomach ache just to enjoy a bowl of plain yogurt. And Isac has literally been caught with his hand in the yogurt jar more than once. Coconut yogurt has a fantastic taste and consistency but is simply too expensive to enjoy more than as an occasional treat (very keen on giving Ashley’s versions a try though!). The salad is super quick as you just need to chop everything up. 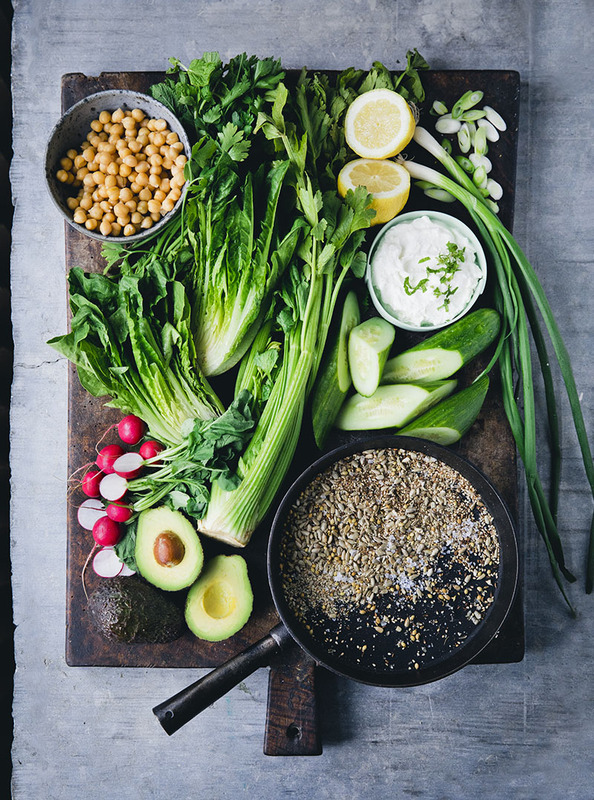 We found that crunchy vegetables like cucumber, celery, sturdy roman lettuce and radishes work really well here, with the avocado and melon adding softness and sweetness. The yogurt is, well, just yogurt. It needs to be quite thick to hold up the topping – our preference is Greek yogurt but choose whatever you prefer. The only thing that needs a little more preparation and heat are the spiced chickpeas. Even if the ingredient list looks long, it’s simply spices, oil and chickpeas and the result tastes way better than just using plain chickpeas. They have a rich, spicy and slightly nutty flavor which works so well with the freshness from the yogurt and the crunchy and sweet salad. There are plenty of ways to vary this recipe and we’re going to leave you with a few ideas. – Whisk some creamy goat’s cheese into the yogurt. It will dissolve, become smooth and give the yogurt a more mature flavor. – If you don’t have all the spices at home for the chickpeas, use what you find. A bread spice mix works great along with a little cayenne. A turmeric or curry version would be interesting too. – You can skip the salad and pour the yogurt into small sealable jars with spiced chickpeas on top. Store them in the fridge for a quick snack. – Vegans can of course use a vegan yogurt option or simply settle for the salad with warm chickpeas stirred through. – Roasting the chickpeas in the oven together with eggplant or pumpkin could be amazing on top of the yogurt as well. Let us know if you have any other favorite variations on savory yogurt bowls and we can include them in this list. For the cucumber & melon salad: Wash all produce. Cut cucumber and melon in large bite-size pieces. Trim and finely slice spring onion, celery and mint leaves. Cut the avocado in half and remove the stone, then cut into cubes. Trim the radishes and thinly slice them. And chop the roman lettuce. Place all prepared ingredients in a mixing bowl, squeeze over lemon juice, drizzle with olive oil and a little salt, give it a good toss and set aside. For the spiced warm chickpeas: Add all seeds and spices (except for the ground spices) to a dry skillet, heat gently for a couple of minutes while stirring. When the spices starts to pop and smell fragrant, they’re done. Pour into a mortar and give them a few bashes with the pestle (alternatively on a cutting board and use the back of a chef’s knife). Transfer the seeds and spices back to the skillet. Now add oil (start with the lesser amount and add more later on if it looks dry), ground spices and chickpeas and heat on low temperature for 2-3 minutes. Stir to combine. When the chickpeas are warm and covered in spices and seeds, remove from the heat. Dollop the yogurt into four bowls. Use the back of a spoon to smooth it out. Arrange the salad on one side of the yogurt and the spiced warm chickpea on the other side. Drizzle a little extra oil on top. Enjoy immediately while the chickpeas are still warm. In all my excitement over a simple bowl of yogurt, I almost forgot to mention that we are coming to London and Bath next week for a couple of book events. We’re very excited and can’t wait to meet some of you! We’re having a supper club at Grace Belgravia on Monday 5 June, 7-10 pm. More info here. We’ll do talk and Q&A at Whole Foods Market in Kensington on Wednesday 7 June, 6.30 pm. More info and tickets here. We’ll also do a talk and cooking demo at Topping & Company Booksellers in Bath on Friday 9 June, 7.30 pm. More info and tickets here. Finally, we’re having a hands on cooking class at Bertinet Kitchen in Bath on Saturday 10 June, 10 am. Tickets here (only one left).